The play Moore described — known in Moore-Manning terminology as “Dig” — was so simple that Fedora didn’t believe it. But that play, along with a handful of others, helped the combination of Manning and Moore lead one of the most unprecedented runs in modern football history. That era is over now. Moore retired from the Colts some years ago — first taking a role as senior offensive coordinator and then moving on entirely — and now is a consultant to various teams. More famously, Manning is also no longer a Colt, but the offense the two men created together remains alive and well in Denver — a somewhat surprising fact to some. When Manning signed with the Broncos, the early wave of headlines like “Broncos’ playbook will be new to Peyton Manning, not coaches” seemed designed to convince us that the Manning-Moore offense was gone for good. As they gained exposure to their new quarterback, though, the stance of Denver’s coaches grew more flexible. Offensive coordinator Mike McCoy noted that he’d “be an idiot” not to listen to Manning, and that the goal was to find a “happy medium” between the approach of Denver head coach John Fox and what Manning had previously done. The enduring wonder of the Manning-Moore offense was not only its incredible success, but the way that success came about: by running the fewest play concepts of any offense in the league. Despite having one of the greatest quarterbacks of all time under center, the Colts eschewed the conventional wisdom of continually adding volume to their offense in the form of countless formations and shifts. Sorgi was not kidding. Out-executing opponents is easier with no. 18 and the veterans around him, but the offense Moore developed for Manning drew its strength from its simplicity. By using a small number of personnel groups — typically either three wide receivers and a tight end, or two wide receivers and two tight ends — it limited the number of possible responses from the defense and made it easier for Manning to diagnose its weak spots from both a speedy no-huddle (used whenever a defense tried to substitute) and a regular pace of play. The small number of plays essentially put the full offense at Manning’s disposal at any time, and by combining few formations with few plays, both veterans and newcomers to the offense had their acclimation eased by the small number of tasks. There were just a handful of routes, typically from one side of the field or the other, run just the way Manning liked them. Despite media intimations to the contrary, the most sophisticated quarterback in the NFL ran what was arguably its simplest offense. It also just happened to be the best. When Peyton Manning chose the Broncos, part of the decision came from him actually wanting to learn their schemes. Denver offensive coordinator Mike McCoy has a well-deserved reputation for flexibility, a necessary trait given that in the last three years his quarterbacks have been Kyle Orton, Tim Tebow, and Peyton Manning. Early this season, however, the team’s offense was undergoing something of an identity crisis, much of it understandable. Manning was still recovering from a neck injury that sidelined him for an entire season, and his supporting cast was both all new and largely unproven. The question was whether McCoy would adopt more of Manning’s old playbook. There were already discernible pieces, but like an undergraduate’s attempt to “update” Macbeth, something had been lost in translation. Most notably, the offense teemed with new formations — often with two running backs in the backfield, something Manning rarely did in Indianapolis — and new plays, without much of a hint of the up-tempo no-huddle approach Manning had used to such great effect with the Colts. By using Tamme as the fulcrum, Manning is able to analyze the defense and get into one of his handful of preferred plays. 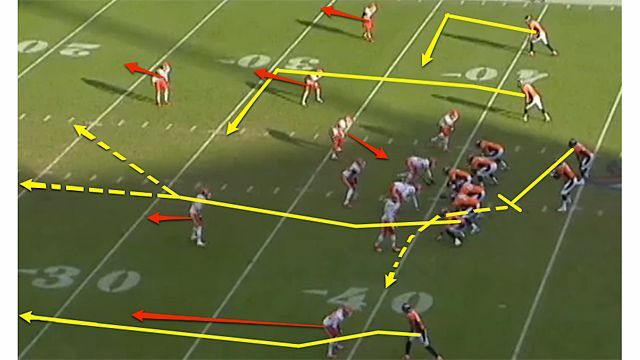 Although the Broncos running game is a bit different from what Manning used in Indianapolis — primarily because the Broncos use more inside runs with pulling guards while the Colts’ best play was the outside zone — the passing game has become virtually identical: three and four verticals, deep cross, all-curl, and a drag or shallow cross concept. But the play Denver runs more than any other is the same one Tom Moore diagrammed on the back of a golf scorecard for Larry Fedora roughly a decade ago. Known as “Dig” in the old Colts playbook and as “Levels” to most coaches, the play has an inside receiver run a square-in or dig route while an outside receiver runs a five-yard, in-breaking route on the same side of the field. On the other side, an inside receiver runs a “Read-Seam,” either streaking up the seam if there is a single deep safety or breaking to the middle between two deep safeties. 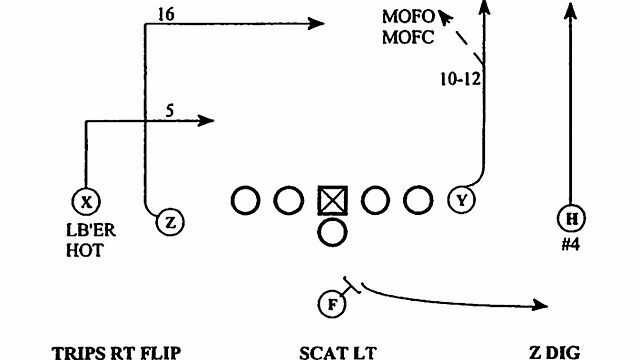 The image below is the actual page from Manning and Moore’s old Colts playbook. It’s difficult to overstate how often Manning ran this with the Colts and how often he still runs it with the Broncos. Ten times a game in various forms and from different formations is not uncommon; if games in which he’s throwing a lot, 15 or 20 wouldn’t be unheard of. Dig is Manning’s Lombardi sweep: You know it’s coming, but try to stop it. The Broncos ran it early and often two weeks ago against the Chiefs, setting the tone for what became a 38-3 drubbing. 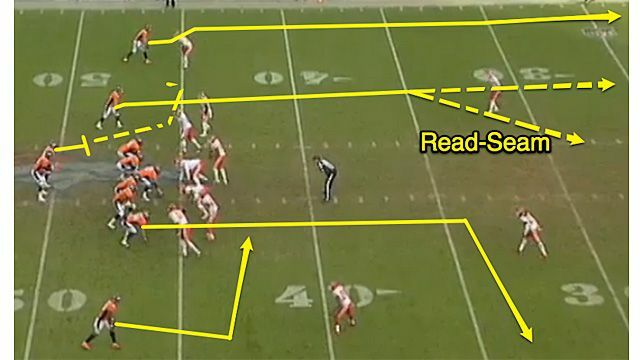 The Chiefs showed soft coverage, and Manning is essentially reading this play high-to-low: the Read-Seam to the deep dig to the short in. He’s been doing this so long he can often quickly zero in on where the ball needs to go, and this play is no different. After making a quick run fake, Manning knows immediately that Eric Decker will be open on the short in-breaking route and hits him for a quick gain. Dag is what most coaches call a “smash” or “China” concept, in which an inside receiver runs a corner or deep route over the top of an outside receiver who stays short. This creates a high-low read for the quarterback. The beauty of Dag is that to the defense everything looks the exact same as Dig — right up until that inside receiver breaks outside, not inside. The image below is the page showing Dag from the Colts playbook. 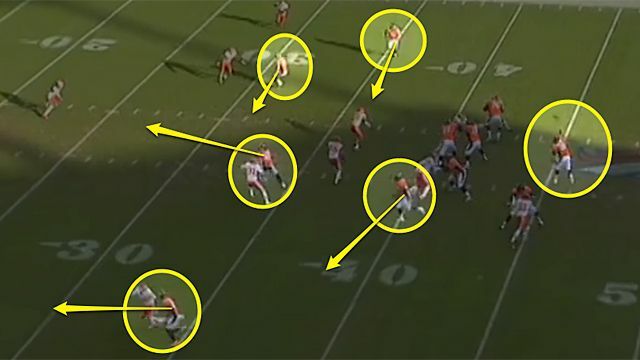 Against the Chiefs, Manning and the Broncos followed several successful iterations of Dig with Dag for a key first down. 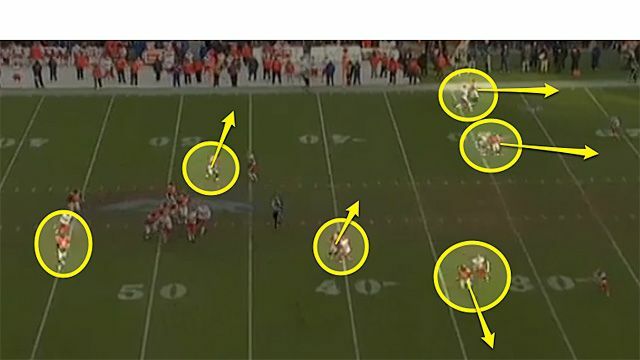 This time, the Chiefs showed a true two-deep look, with the cornerback indicating an aggressive technique in how he lined up over Demaryius Thomas. Manning knows the window will be there for his tight end; the only question is whether he’ll have time to throw. After the snap, Manning glides — about as gracefully as he’s capable of — to his right before throwing a strike to his tight end. The Chiefs didn’t do a particularly poor job on the play so much as Manning was at his most lethal. None of this is groundbreaking, but that’s the point. “No matter how many hours you study opponent films,” Sid Gillman, legendary NFL coach, used to repeat, “there’s only going to be eleven players on the other side of the line of scrimmage.” It’s a simple game in which strategic beauty comes not from being surprised by some new clever trick, but from the sublime, routine brilliance of a master in his element. I don’t blame the Broncos coaches for trying to blend what they’d had success with previously — and what many of their existing players were comfortable with — with Manning’s preferred approach. Indeed, that pitch was likely what sold Manning on going to the Broncos in the first place. 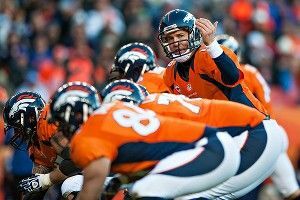 In the NFL, however, where a team’s success is often a function of its quarterback play, it’s not a surprise that what’s good for Peyton Manning is good for the Denver Broncos. Couple this with just how damn well put together the original Manning-Moore offense was, and we’re left with 11 straight Denver wins. But while we’re used to Manning’s excellence, that shouldn’t stop us from marveling at it. The plays might not be new, but the team, coaches, and teammates are, and Peyton Manning looks as good as ever. When asked, Manning has said it would be “too informative” for him to confirm or deny if the offense he’s running in Denver is essentially identical to what he did in Indianapolis.